Not all pizza is created equal. In fact, pizza can be made healthy, especially when you make it yourself. Whole grain and chickpea crusts are nutritional powerhouses compared to white flour crust. 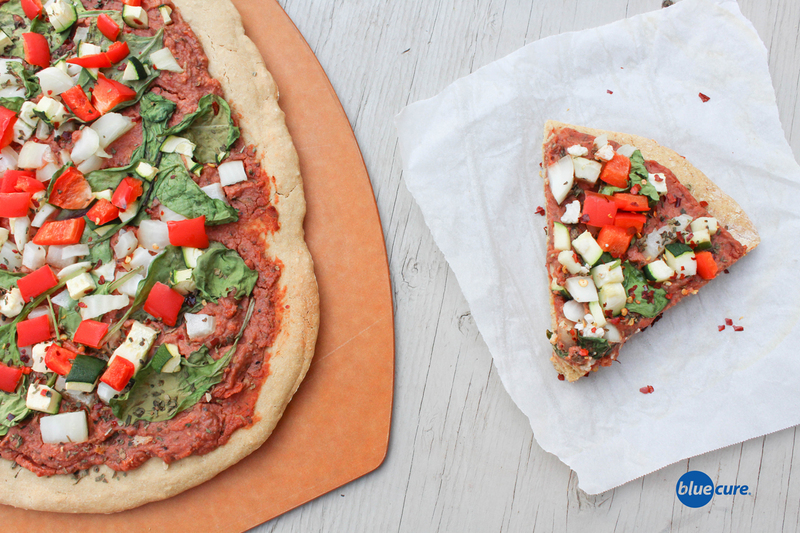 Top the pizza off with mounds of veggies and a healthy tomato sauce. Hold the cheese and sprinkle on some nutritional yeast! Now you can eat pizza and feel great after eating it too! Let me just recommend, using 1/2 whole wheat flour (1.25 cups) with 1/2 chickpea flour (1.25 cups) is a delicious combination. *1/2 whole wheat flour, 1/2 chickpea flour is a great combo! Preheat the oven to 350F. In a bowl, combine the flour with baking powder. Mix until evenly distributed. In a separate bowl, combine the applesauce with the water and mix well. Pour the applesauce mixture into the flour and stir until a dough is formed (note: if using all chickpea flour, it will be a bit more like cake batter mix and not dough). Lay parchment paper onto a baking sheet, and then spread out the dough onto the pan. If your dough is thick, use a rolling pin to spread. If the mixture is like batter, use a spoon and form a large circle on the parchment paper. Bake the pizza crust for 10-15 minutes. While the pizza is baking, blend together the beans, miso paste, water, tomato paste, diced tomato, garlic powder, nutritional yeast, oregano, rosemary, onion powder, paprika, thyme, basil, and black pepper. Blend until smooth. Wash and chop the rest of the veggies (onion, zucchini, bell peppers, and greens). If using cauliflower, try grating it so resembles cheese. Once the pizza crust is finished, top it with the creamy bean sauce and veggies. Add more basil and crushed red pepper, if desired. Place back into the oven for another 15 minutes or until the veggies are desired texture. (*Note: you can also sauté the veggies first and then add them to the pizza, but if you prefer one less pan to wash– stick to the original instructions). Slice the pizza and enjoy! Serve with a side salad.